We designed our Sal del Mar hand-embroidered bar towels with the idea that we could take an ordinary setting and make it say "party." We went with our Tequila hand-embroidered towel for this setting on a window ledge. We liked the way the light shnes through the martini-style glasses, and how the white linen and green with indigo-blue highlighted towels are like a piece of art work to show off the simple setting. 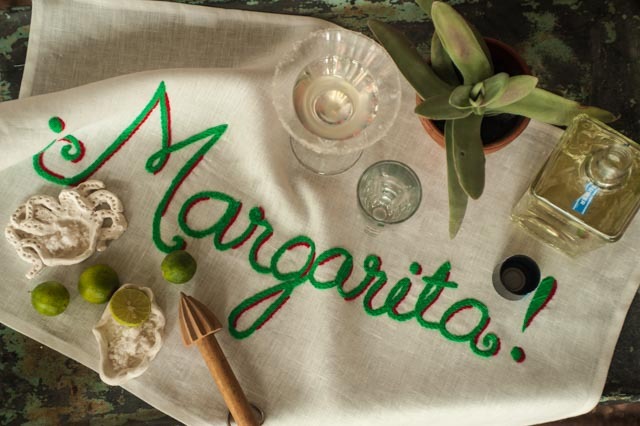 Of course, you can even find a place on the countertop in the kitchen and try out the Margarita bar towel with its magnificent sprawling letters in lime green. You will set out your beloved tequila. Set out limes, a shaker and martini-styled glasses rimmed with our Sal del Mar gourmet sea salt. And voila!